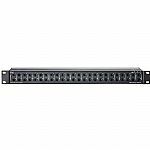 Notes: The ART P48 48 point balanced patchbay is the best solution for organising cables while optimising connectivity in any studio or live PA rack. Designed for maximum convenience, each pair of TRS 1/4" balanced I/O can be configured for normal or half normal operation. The fully shielded steel 19" 1U rackmount chassis has reversible rack ears for maximum flexibility. Notes: The ARTcessories TPatch is a compact 8-point balanced patchbay that organises your cables into a convenient central location on your studio desktop. 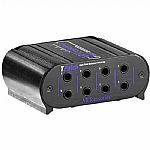 Designed for maximum flexibility, the TPatch has 1/4" TRS phone connectors user selectable normal and half-normal modes. The compact black-anodized all aluminum case and it's passive design allow the TPatch to provide years of trouble free service. Notes: Is your pedalboard brain-dead? The Patchulator 8000 pedalboard patchbay provides a tangle-free way to change the order of your effects to create new tones using little to no brainpower! With the provided mini cables, just patch signal from your guitar or bass into (and out of) each effect, then back out to your amp or mixer. 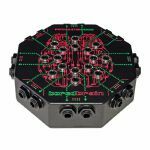 Invent new and interesting sounds while your synapses are firing, simply by rearranging the sequence of effects! All your gear and cabling stays put. Oh, and any effect not patched is "truly" bypassed... Genius! In the world of electronic music, the Patchulator 8000 desktop patchbay becomes a powerful nerve centre for your instruments, allowing you to share and swap effects all around your setup, without needing to solve a brainteaser. Just connect your keyboards, synthesizers, samplers, drum machines (or any sound source) to a few channels, then fill the other channels with your effects' ins and outs. Using the mini patch cables, you can then route any of the effects into and out of the signal path of any instrument, just like a real patch bay! Hmmm... what will you mastermind?